The Aspen Highlands ski area has long been a local favorite for its expert trails and its panoramic views of Maroon Bells. The 2002 opening of the Highland Bowl added inbounds backcountry skiing on slopes that are among North America’s steepest. Aspen Highlands reaches an altitude of 11,675 at Loge Peak from a base of 8,040 feet for the main ski area but hits 12,392 for Highland Peak at the top of Highland Bowl. It has 118 trails covering 84 miles on 1,028 acres and is served by five chairlifts with a capacity of 6,500 riders per hour. But the Highland Bowl is accessible only by hiking 30 to 45 minutes. Aspen Highlands classifies 36 percent of its runs as expert, 16 percent as most difficult, 30 percent as more difficult and 18 percent as easy. The expert and more difficult runs can be found throughout the main mountain. The Highland Bowl has been hailed by expert skiers for its double-diamond runs with an average pitch of 40 degrees and a vertical drop of 2,000 feet. The 48-degree pitch on the Go-Go-Gully run is the steepest in Colorado. 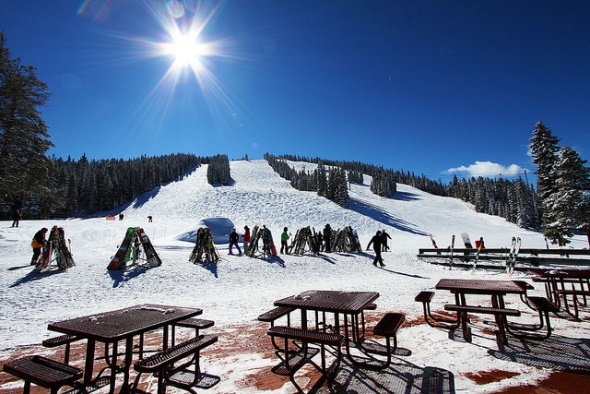 The ski area averages 300 inches of snow, with a ski season that begins in mid-December and runs into late April. It has snowmaking capability on 110 acres. Aspen Highlands has two restaurants, Cloud Nine Alpine Bistro and Merry-Go-Round, both in the middle of the mountain. Highlands was developed by Aspen businessman Whip Jones and opened in 1958. Jones donated the ski area to Harvard University in 1993, and it is now run by the Aspen Skiing Co., which also operates the Aspen Mountain, Buttermilk, and Snowmass ski areas. It was expanded into the Highlands Bowl, which faces Aspen Mountain, in 2002.